Don't fall in! The bridge across this stream is narrow, only allowing for two ponies to cross at a time. But, there's always the wider path through the cool water! It's a nice place to stop and dip your hooves in—when there isn't a race going on! Lampwick had just been lost in her thoughts, gazing out over all those apples and trees, and how delicious they looked. She was certain she could make the time for one if she came upon it. Oh the joys of traveling; finding new fruits and flowers to taste- ponyville apples hadnt been on her list of recently enjoyed in a long time- it looked like it would be time to change that! Putting a little excited flick into her tail, she began to turn back to the path when a soft, melodic voice reached out to her; it tickled her ears in a friendly way; much like a friendly nibble across the whithers would. "Careful there, the apple family can be awfully defensive about their trees, and a couple of them are in this race so they may spot you." Lampwick turned her head to catch the playful smile of a sky-blue unicorn with golden eyes- that matched the golden mark she sported along her flank. Lampwick couldn't place the name of the instrument, but it looked vaguely familiar to her. It reminded her of her youth at canterlot; but those days were spent daydreaming about other locations in the world- and truthfully, her life in Canterlot was much of a blur to her nowadays. She opened her mouth to speak, but found that no words would come; she wasnt a witty pony, or a terribly social pony- but she knew she wanted to say something, but not what it was. Instead, she simply watched the blue pony trot off and disappear amongst the many ponies as easily as she'd stepped into her life. She reminds me of Canterlot. Giving it a moments thought, she finally shrugged and let her smile bud across her face. I'll think of it eventually~ With that, she flickered her tail and joined back in the race, leaving the visage of the acres behind her, to follow the path downward that cut between them. She kept up a brisker pace than normal, fueled by her curiosity to search the crowd of ponies. She saw many slowing to take a break, some chatting, some tossing objects between one another. She even stopped at an applejuice stand that looked like it was being mobbed by thirsty ponies. She listened to a particular pair of a parent/foal co-team running the race together that made her smile; and even saw some ponies sharing berries together on the side of the path, but as she continued on moving her way up the pack she still hadn't caught sight of the blue pony from earlier. After a good hour of running, Lampwick needed a break. She caught her breath at the edge of a small glade, just past a small bridge that overlooked a babbling brook. The trail had begun to get much thinner, and ponies were having trouble sharing the path; but when it came to the bridge it was an out-right stampede-jam. She had gotten lucky to fit through with a small foal with a white coat who had shown amazing speed and stamina, but other ponies were bunching up and jostling each other (rather nicely, considering) in order to get through the bridge first. Many pony had decided to bypass the bridge and try their chances racing down one bank, splashing over the wet stones, and up the other side of the bank. While she was certain she had passed a good many ponies, she watched as a good many passed her in turn. The sight and the feel of the entire thing was...exhilerating. She didn't care if she won or not- just the feeling of running with so many ponies made her feel as if the entire forest....was alive. Her heart beat with excitement- she was itching to get back on track- but first she needed some water. With care to not slip and injure herself, she made her way down to the brook, let her mane down, and took a long refreshing drink. The race continued on, leaves crunching under pony's hooves, it was great! The energy of all the ponies together proved to be doing its job as the trees were indeed dropping their leaves. The ground behind them was a multi-colored mess of leaves and twigs. Zephyr wasn't in front, but he wasn't terribly far behind either. The race was going smoothly, but up ahead Zephyr saw what would be trouble. A narrow bridge that would definitely bottleneck the mass of ponies galloping toward the finish. There wasn't much time to decide what to do at this speed and Zephyr wasn't about to slow down yet. He was jammed between a few racers, a light green mare, kinda cute, and that big earth pony... somepony could get hurt in all this. He wasn't about to take his chances with the bridge and opted to take the path off the bridge through the water. Whether or not that was a good idea was uncertain. He darted by the light green mare, barely grazing her, but not enough to set anypony off-balance. 'Close one...' He dropped down beside the bridge and began to dart across the water, or he would have... Zephyr had made a terrible miscalculation about how shallow the water below the bridge was and went hoof first into a much deeper river than he had foreseen. He tripped and surprise faceplanted into the river. 'Ah great move Zephyr!' He backed out of the river and shook his coat off, trying to get as much water as he could out of it. The water felt nice though, despite its unwelcome presence. The cool water was enough to offset the irritation he'd normally have gotten from such an event. Climbing ever higher, Swift Breeze spotted a group of pegasi along his flightpath. Slowing, he hovered in place as he came up to them. He blinks in confusion for a moment before stepping onto a cloud. He drapes his heavy blanket around his neck with a shake of his head. "Good day." He bows his head respectfully to the other pegasi. He glanced back down at the running ponies and smiled. It had been far too long since he had been able to see such a view. So many ponies were running below. His gaze lingered for a while as he saw the foliage thinning as the racers passed the trees and approached a brook. Looking back up to the others, his expression once again turned serious. "Might one of you know more about the screaming pony over there?" He turns his head toward the winding plume of smoke. "As a monk of the Mylit Elpo Nis temple, I could not in good conscience keep running in the race while somepony needed help." He nods in a sage manner, stretching his wings and moving them about after keeping them bound up so much. He might lag behind in the race due to the detour, but somepony had to do something. He thought back to the flight training given by his masters at the temple. Thanks to that and all its crashes, collisions, and blows, natural or induced by somepony else, he figured any sort of trouble this might have should be foal's play in comparison. Number 34, Klondike, had finally managed to catch up to what he assumed was the main part of the herd. Whether he was at the head, middle, or the rear, he could not really tell. He had run past a bunch of ponies while galloping furiously to catch up, and, no matter how many he passed, he could still see haunches with numbers in front of him. The only thing he could tell though, and if his heaving chest was any indication, was that he was sweating profusely. And, as the herd of ponies in front of him began to crowd tightly together, it only made him more aware of just how hot and sweaty he had become. With a twitching right ear, Klondike shot his head up trying to see above the rest of the ponies’ heads. Not being able to see well above the rest of the ponies, he immediately began to look around to try and find a vantage point… And an excuse to get out of the hot crowd. Spotting a rock a little bit off to the side, he began to politely push his way through the tightly knit crowd of ponies and gingerly climbed on top of the rock so that he could see what was up ahead. What he saw did little to raise his spirits. His thoughts were suddenly interrupted as his right ear began to twitch again as the subtle splashing of water reached it. Turning his gaze towards the source, he immediately spotted the river and the ponies that were crossing it. “Hmm, I suppose that ain’t cheating. Not like there are any trees on the bridge, so why would it matter if we crossed the river instead. Beside, the important thing is that we knock down the leaves of the trees on the other side of the river, right?” He had already hoped off the rock and was making his way down to the river before he had even finished convincing himself it wasn’t cheating. When he finally reached the bank of the river, he could not help but let out a sigh of relief. The water looked so inviting that he could barely fight off the urge to just jump in. Instead, he approached the edge of the river and took a few long sips of its cool water. A few other ponies were doing the same. After a seconds of having his muzzle buried in the river’s water, a now fully quenched Klondike suddenly brought his head back up, muzzle still dripping water, and announced his plan while startling some ponies and causing a few to look at him oddly. “ALRIGHTY! First, get into the river. Then, wash some of this sweat off. And lastly, reach the other bank and continue running!” The confident expression with which he said this only lasted a second as he then immediately looked at his flank and the two pieces of paper that adorned it. The ones he had stuck on with duct tape at the beginning of the race. “Hmm, actually, I don’t want those to get wet and soggy. I should take them off first and then put them back on once I’m on the other bank.” He commented more to himself then to the group of ponies gathered at the river’s bank. Without so much as a second thought, he reached over and took the first piece of paper and duct tape in his mouth. Holding the two pieces of paper with the number 34 in his mouth, Klondike left two rectangular bold spots on his flank and a bunch of confused, if not shocked, ponies looking at him. Lyra smiled as she listened to Mojo tell her about his home and his goals in life. Take things easy, spread peace and love, have a good time. It sounded wonderful. She nodded at his plan to win the race. "Well, you seem to have the right attitude about the race Mojo. I'm pacing myself too. I'm not aiming to win, though I'd really like to. I'm here to burn calories and to better myself. I'll get some exercise, get fit, and then I can eat as much chocolate fudge cake as I want!" she cried triumphantly. As they ran, the ponies got to the bridge where there was already an enormous pile-up. "Oh, shoot! We'll be here forever!" She fell in line behind the other racers, but the queue wasn't moving at all. Two burly looking earth ponies at the front had gotten into some sort of argument about right of way, and now neither one would move until the other admitted defeat. Lyra found herself getting increasingly annoying, especially as she was being jostled and shoved by other impatient ponies. A dark green pegasus who had shoved himself inbetween her and Mojo pulled past; he barely even touched her, but it was the last straw. Pulling back out of the throng, Lyra looked around for another way to cross. She considered wading across the river, but she didn't want to do the rest of the race soaking wet. She spied the pegasus that had moved past her now standing on the bank, dripping wet from head to tail. Obviously the river was pretty deep. Lyra dragged herself out of the river, her sodden coat weighing her down. She shook herself off, spraying some nearby ponies with water, but she didn't care. She shot a glare of annoyance at those around her before moving back onto the track. At least she was on the other side, but was it worth it, she wondered? Yes. Yes it was. The sooner she finished this race, the sooner she could go to Sugar Cube Corner and pig out on cake. Using her magic, she telekinetically rung out her hair, trying to get rid of any weight that would slow her down before carrying on. Gilda looked all around in front of her. She could see it. She was near the front. She felt then as if victory was in her grasp, even if the race wasn't even half over. Despite her strong showing, there were still a few ponies ahead of her that she just couldn't seem to catch up to. This made Gilda angry. She refused to believe there were ponies faster than she was. She quickly became quite desperate to put them all behind her. Entering the third leg of the race, Gilda found herself approaching a large brook. Just great. She really hated getting wet. Swimming just wasn't her thing. Looking for a way to avoid just that, Gilda noticed a narrow bridge just ahead. This would have been a fine solution, but Gilda soon noticed the crowd in front of the bridge. Countless ponies were crowding for an opportunity to pass, with only two at a time being allowed to walk slowly across. That was going to take forever! She wasn't too crazy about the idea of bunching up with all those lame ponies to wait for it either. As she approached the stream, Gilda mused hard about what action to take. Should she bunch up with the dweebs for a chance to across or get her feathers saturated in all the stupid water? After only a few moments of thought, Gilda came to her decision. It was obvious. There really was no question. She was better than this race after all. "Screw the rules," she said smugly, laughing to herself. "I have wings, so I'm gonna use them!" With all the force she could muster, GIlda flexed her wings, freeing them from the loosely tied rope that had previously bound them. She had actually planned to cheat all along. As far as she was concerned, races weren't about playing fair, they were about winning. Being smart was just as important as being fast. In this case, it was stupid not to take advantage of her flight. If any of the lame ponies wanted to call her out for this that was their problem, not hers. With that settled soundly in her mind, Gilda stretched her wings and took to the air swiftly, flying just over the brook and to the other side in just a few seconds, bypassing the bridge and the water entirely. Once there, she folded in her wings like nothing had happened and continued racing with the other ponies, feeling not the slightest bit guilty as they stared. She then returned to her previous strong stride almost completely unabated, cold determination in her eyes. Winning was all that mattered. She was going to prove herself as the coolest to Dash (wherever she was), she was going to demolish that idiot Pinkie, and she was going to wipe the floor with all these other ponies just for good measure. If she needed to strike a few low blows, then so be it. None of these lame ponies could hope to stop her. As Clutch continued running on the path he was on after his short breather, he saw a few other competitors still trying to catch their breath from so much running. Knowing that an opportunity as such very rarely ever comes to be available for the taking, he ran past them without even trying to slow down. If he was to win this thing, he'd have to keep on going and only stop when he absolutely had to. That way he'd be able to plan out his periods of rest well so he wouldn't waste too much time. Otherwise he'd end up with competitors catching up and trotting past him. As such, he knew that he'd have to watch where he rested at, and when. After some more time had past, a calm, bubbling brook was cutting into the path that Clutch was running on. The water was flowing slowly, seemingly as tranquil as a quiet summer's day. A bridge was connecting both sides of land separated by the river together. It was made of wooden boards that were connected to two side supports to keep them from being moved about too much. Mahogany, he assumed the boards were.made of. A somewhat sturdy wood that would be able to handle a river such as this without much problem. The sidings were painted white, whilst the boards themselves were of a more dark-red coloring, possibly to contrast between the two. For the diamond dog looking at the river whilst running towards it, it was either swim through the river, or run across the bridge in order to cross it. Unsurprisingly enough, Clutch chose the bridge to get over the river. Turning his body to face the bridge, he dashed towards it. He lowered his body a bit and moved his arms behind him, straightening his body to face right at what he was running towards. He ran and ran, until he was right at the bridge. Once he reached it, he did a daring move: He grabbed the sidings whilst still running, put his body into it, and swung himself forwards as well as his arms would allow him. His body propelled over the bridge.....and right to the ground. With a loud thud, he hit the ground hard. It took him a minute to be able to recover from that painful landing, and a couple Ponies ran past him during that time....as if karma itself was punishing him for such a foolish mistake. He still had a race to get through, so after dusting himself off, he continued to run on the path, hoping he could be able to make up time for that....silly mistake that he made there. If things went well, he could still have a chance of winning.....if he could pull it off, that is. "Well, you seem to have the right attitude about the race Mojo. I'm pacing myself too. I'm not aiming to win, though I'd really like to. I'm here to burn calories and to better myself. I'll get some exercise, get fit, and then I can eat as much chocolate fudge cake as I want!" Lyra spoke. "Chocolate fudge cake? Groovy babe!" Mojo neighed as the two continued trotting together. "Me mum has a hip new recipe for that, wish I could bake as well as her. Dad can bake too, but his speciality is breads. Ah! He makes the most scruptious whole grain bread you'd ever taste! It's absolutely smashing!" Soon, the two ponies reached the bridge and the crowd of contestants gathered in front of it. "Oh, shoot! We'll be here forever!" he heard Lyra neigh. "Chill out, love. This isn't so bad. I can remember back home on the farm when..." the Paint stallion stopped in midsentence when he saw that Lyra was no longer with him. "Hey, Mojo! Check this out!" he heard her say, causing him to direct his eyes at the guard rail that the blue unicorn mare was balancing on. "Good show, Lyra!" Mojo shouted, applause-stomping his hooves on the ground. "I used to do this all the time when I was just a foal. I called it "the dragon's trot", after the way the baby dragons would walk around Canterlot on two legs." "I'll have to give that a go meself when you're across, doll! Looks ruddy simple to me. I used to walk over fallen trees on the farm when I was a wee nipper"
Mojo watched as Lyra was near the other side, hearing her call out moments before she had been accidentially knocked into the river below. "Hang on, Lyra, I'm comin'!" Mojo shouted as the Paint Earth pony leapt upon the guardrail and walked quickly along it's length until he saw the blue unicorn emerged from the water. "Well babe, you may be soakin' wet, but at least you're on the other side!" the stallion neighed with a slight chuckle. "Be right there, love!" As Mojo neared the end of the guard rail, balancing carefully with each new step, he heard a familiar sound behind him. "Uh oh," he muttered just as a familiar streak of blue and gray collided with him, sending Saddlesore with his runaway jet pack flying upward. The force of the collision sent Mojo flying through the air until he landed in large green bush that cushioned his landing quite well. "Well now, that wasn't so bad," the Paint stallion said until he heard loud buzzing sounds all around him. The usually calm and collected Mojo instantly panicked. "HORNETS!" Mojo yelled at the top of his lungs before galloping back towards the river, past the frontrunning Gilda (going in the opposite direction) and diving into it to avoid the large swarm of stinging insects that are following him. Now he was genuinely worried. Would the swarm go after his new friend Lyra? Would they attack the other competitors on the bridge? He couldn't tell what was going on while he held his breath underwater and allowed the running river to flow over him. Up above the race course, the Pegasi Louise LaMare, Jubilee and Professor Krashkop began talking to Hoss, a fellow Pegasus that had joined them in midair. "Hey guys, where's Saddlesore go?" Julibee asked just as the screaming blue pony with the jet pack strapped to him shot straight at them, scattering the group of flying Pegasi. "Dere he is!" the Professor announced as he pointed behind him. "Quick! We have to come up with a way to bring him down to earth safely!" shouted a worried Louise. Watching all of this action through the magic portal back at the starting line bleechers was Misty Magic, Starflower and Madam Bistro who had just joined them. "OH NO!" Starflower shouted. "Poor Saddlesore knocked Mojo into a bush and nearly flew into our Pegasi friends!" "THAT DOES IT!" a determined Misty Magic neighed, stomping her hooves into the ground as her unicorn horn began to glow. "Wait Misty! Don't do it! Don't use your magic again!" "I'm going to create a giant net to catch him in! I can do this!" the petite yellow unicorn yelled out as she closed her eyes to concentrate. Starflower gazed into the portal as it showed a large, brown cloth magically appear near the tops between two sturdy looking pine trees. "OH NO MISTY! THAT'S NOT A NET! IT'S A..." the taller light blue unicorn neighed as Saddlesore flew into it, causing the stretching brown cloth to move forward slightly before ... BBBBOOOOIIIIIIINNNNNGGGGGGG!!!! "..TRAMPOLENE!" "Huh?" Misty asked as she watched in horror as the jet pack wearing blue pony shot like a rocket through the air in the opposite direction. "Hay gals, what's this here contraption?" asked a lime green earth pony with gray mane and tail, both tied in buns. "Granny Smith! What are you doing here?" Starflower asked. "Did the race start yet? I ran here jist as fast as I could! I got three of my three grandkids running in it." "The race already began, ma'am," Misty said apologetically. "But this magic portal is allowing all of us to see the action and.."
"Show me Applejack, Big Mac and little Applebloom!" the elderly mare shouted at it. "It doesn't work that way, Granny Smith." "Actually, none of us know HOW it works to be honest about it," Misty sadly admitted. "NotcoolnotcoolNOTCOOLNOTCOOL..!" The frantic and unmistakably squeaking voice of Cat Napper rang out. Horsefeathers, of course the race was today! Why in the hay did she pick last night, of all nights, to stay up on her darned projects?! She was late, the race had already began! "GAH! Oohhh.. hahh... ponyfeathers... hahhah.. they're already runnin'.." The poor little blue mare panted, a nervous cold sweat already trickling down her face as she sliced through the air, a little blue blur in the sky. She began following along the path on wing rather than on hoof, she wasn't quite in the race yet, so rules didn't apply.. right? Ponyville was known for its inclusion of the entire town in these neat little traditions. She'd promised herself to get outside and experience what it really meant to live in Ponyville as soon as she'd heard about the annual Running of the Leaves, but merciful heavens if she'd known it was TODAY..
"Aaagghhh.. blast it all.. " She groaned, finally feeling her wings start to ache from her nonstop and panicked flight all the way to Whitetail Wood. Wait.. was that them? The petite pegasus lifted her sight enhancing goggles to her eyes for a better look. The crowd on bucking and neighing competitors bunched up at the end on a narrow bride, that was them alright! "Awesome.." She breathed a sigh of relaxation and soared down to alight behind the crowd. Hmm, now that Cat was officially in the race, or so she hoped, no more wings. She didn't mind that of course, as they were awfully sore as it was. "Mmhh... hahh.." Panting and near exhausted, Cat took this pause in the road as a moment to wade a little ways into the creek and cool her burning throat with a few laps of water. Now that she was here in the creek, she thought, might as well wade through the rest of the way. She didn't use her wings for flight, rather she extended them out on either side of her for balance and nervously trotted through the treacherous running water. She was nearly there, hooves precariously clinging to slippery algae coated rocks with each step, and would have made it to the other side no problem.. until..
"WAH, HORNETS?! Where?!" She heard the stallion's warning cry and was knocked off balance in surprise. Cat struggled with her hooves to stay on her four, a quickly losing battle, and plummeted head first into the stream. "OOF!" She winced and blinked away a tear as her jaw slammed into the rocks below, head now pounding with an awful headache from the impact. "OOohhh, sweet Luna.. the things I do for experience.."
After a few moments, Cat picked herself up and shook the dizzy buzzing out of her skull. At this point, she didn't care if there were hornets or not, she clenched her teeth and slowly scrambled her way up the side of the bank.. painfully taking a long while as she kept slipping. At long last, she reached solid ground. As soon as she did, she was on her four, hooves pounding in a furious gallop as she sprinted madly along the race path. Whatever was in her way would have to wait, she had a race to run! And she wasn't planning on getting hurt again along the way, that was for sure. Wisp was in a zone, not so much a competitive zone, just zoned on. She didn't even notice when the trail led them through the Apple Family's farm. In fact as she came to the bridge that needed crossing she'd almost stumbled down the bank and into it. Her mind had been focused on chasing a monster that wasn't there, since she'd convinced herself it was the best way to get her to actually run and not just jog the whole way. "Shoot, I gotta get out of my head and actually pay attention. I'd be washed otherwise and this thing has only just started." The bridge was the best answer. Of course most ponies felt that. She watched a one too many tried to crowd themselves onto the narrow way and got themselves all tangled up. So maybe that bridge wasn't the best idea. Those who were too interested in winning were trying to force through on it, and in the end were getting hung up. Three plus pony pile ups on the path were going to be a problem at this spot. The other option was the water. Wisp glanced down and spotted a fish as it darted by. Clear and running meant just one thing, cold. And even though she wasn't a fan of being hot by any means, she wasn't a fan of diving into icy cold creeks either. It was time to put her mind to work. Her red eyes darted back and forth for a moment and then she saw them; a few scattered stones in the water. The path wasn't straight and a couple were a bit of distance apart, but she was sure she could hop across the water that way. "Okay, let's get back on track," she commented to herself, readying for that first hop. One! She landed on the stone closest to the bank. Two, she leaped to the next, slipping just a little on the wet surface. Three, it was hard to balance on this one, it was pointier than she original thought it was. Four, just one more but it was the furthest away. And with that final deep breath and a leap of faith, Five! Willow Wisp sighed as she landed on the final stone, it was just a little hop from it to the bank. And she did it all without getting wet. "Alright, now back to ru-"
Well almost without getting wet. A couple ponies from behind her decided to forge the water and charged right through. She found herself splashed with the cold spray she did her best to avoid. "...running..." she grumbled as she shook the water from her glasses and took off along the path once again. The ponies around Breaker began pressing inward, pulling him straight out of his near-trance state and back to the present. His gait grew a bit awkward as he bumped shoulders with some of the smaller ponies. "Aye, me, dis gettan a bit close f'comfit ineeyah," Breaker said, working his way to the outer edge of the throng around him. "Not koooowite what eem 'avin' in mind fer de middle, bredren!" He called with a laugh, settling back into his steady, loping gate. Before he could actually register what was up ahead, something from above caught his attention. He tilted his head, trying to look up through his heavy, dreaded forelock, only barely catching a glimpse of a massive trampoline appearing out of thin air, and a blue and silver streak leading a trail of smoke bouncing off and jetting back in the direction it came. His head nearly swivelled all the way around to follow the contrail, not looking where he was headed at all. It wasn't until the water splashed up around his hooves that he started paying attention to where he was going. "Hoooooo yah! I'nt know dey be a swimmin' stretch!" Breaker whooped, galloping into the brook, completely oblivious to the bridge to his left, and diving in to swim through water shallow enough for him to easily gallop through. As he dove he came muzzle-to-muzzle with a slightly panicked looking brown and white stallion. Thinking that the pony couldn't swim, and conveniently ignoring the fact that the water was quite shallow enough for the paint to stand on his own, Breaker wiggled underneath him and stood, the stallion now draped across his back, and trotted toward the opposite shore. "You'n lucky I be comin' along, m'fren. Dem ponies 'oulda trampled till you'n drown!" Breaker grinned and tossed his dreads, now heavy and wet with water, to indicate the many other ponies opting to skip the bridge and cut through the brook. Quickly, Shanna galloped the rest of the way out of Sweet Apple Acres. She passed a growing number of ponies over the next few miles, then came around a bend to find she could have saved her energy, seeing the massive logjam of ponies at the narrow bridge. "Hi Mojo!.. oh drat, he's already crossing..."
She clopped on down to the edge of the brook, already finding other ponies had the same idea, making a jump to dodge that screaming pony wearing a zoomy thing. She called after him "Hay you! That looks dangerous! Go land somewhere!" "Hey Klodike! Gonna cool off too huh?.." as she pulled her numbers off and stuck them in her underwing pouch for the moment. When she looked up, she saw Klondike rip his numbers off, held on with silvery ductape. Shanna's tail and mane flew up in horror as she saw the spectacle. "Oh my! That had to hurt!" Pausing for a moment, she looked around for the yellow foal she spotted earlier to see if she needed help coming across, then trotted into the water, cooling off her body quckly. Just as she reached the shore, a shadow passed over her. Looking up, she saw that griffon set down and fold up her wings as if nothing happened "Grrr, Cheater!" She broke into a trot to catch up with the griffon "Hay! I saw that! Cheat!" Before she could break into a gallop to show up the griffon, she saw Mojo coming right at her! She dodged aside, then saw why he was running. Her blue eyes bugged out and she wheeled in place and sprinted back the way she came. "HORNETS!! BACK INTO THE WATER!!" Hoss neighed, nodding his black maned, reddish-brown head and pointed toward the elder green pegasus. "Apparently he made the device and talked somepony named Saddlesore into trying it. It is powered by the light of Celestia's sun. I'm betting if we can cover it, it will turn off but we'll all have to work... OH CELESTIA! DUCK!" Blue eyes wide, the stallion dove off his cloud just as the screaming runaway flier hit it and poofed it to vapor. A moment later the runaway made the others scatter behnd him. Hoss shook his mane as he righted himself, looking more worried. "Is everyone okay! Professor! We need to talk! We all have to do this together to catch him when we get that.. that THING! turned off! Which of us is fastest and most nimble? That pony will have to catch up and cover the thing with a blanket! If it works, the rest will have to catch saddesore or he is doomed!" Suddenly his eyes bugged out as he watched the jetpack swoop at the racers below, passing over his sister among others. A unicorn in the race must have had enough as something appeared in it's path. "Someone else has the right idea! I really, REALLY hope that catches it like a net..."
Hoss gasped as the "net" stretched, then sprang back, flinging the runaway right back at them. "GET READY! HERE HE COMES AGAIN!!" Madam Bistro gasped in horror as she watched the runaway flier. "Oh My!" Moments later, he noticed a familiar lime green mare come up beside her and speak to the others. 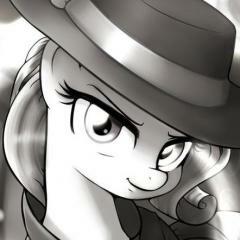 The mocha mare smiled and nodded to her pleasently "Good morning, Granny Smith. So nice to run into you again since Appleoosa. How have you been?" Bistro was suddeny nudged in the flank. She looked back to see an orange pelted unicorn colt with a teal mane. Snails bounced on his hooves "Yum! That hot chonklet smells awesome! May I have one, eh?" Bistro nodded "Oh yes, right away!" As he waited for the drink, Snails suddenly noticed the action and bounced even more "WOW! A scrying screen! Awesome! Whoever did this is a cool magician!" The pounding hooves, the falling leaves, the brilliant scenery, everything was just so beautiful! Estrella galloped along with the large group of ponies, mane flailing in in the wind. She was pushed to and fro by other racers and pushed back some herself, it was all mostly in good fun so no grudges were held. As she ran on she couldn’t help but continue to glance around at the scenery, the falling leaves really accentuating the land scape. Little by little she began to fall behind, her imagination running rampant as she gazed around. “OOF!” She grunted as she ran smack dab into another pony’s backside, day dream shattered upon contact. “Sorry about that.” She smiled sheepishly, the other not hearing…or practically feeling her in the first place. There was a huge pile up of ponies trying to use the bridge to cross over the water, most of them rushing onto the precarious looking bridge. “HORNETS!!! !” Some other pony shouted which caused her to blindly look left and right. Already she could hear, or so she thought, the horrible buzzing of those stinging little fiends. She didn’t much want to get wet, but that was way better than being in pain. Saying various apologies left and right she wiggled through the gathered ponies who were still intent on using the bridge, dashing down a small hill and then SPLASH, right into the stream. The swim wasn’t too bad, she didn’t realize she needed a cool dip until she was submerged under the water, an excited little gasp leaving her body from the quick cool down. She carefully made her way to the other side of the bank, pulling herself up from the waters and giving a brisk shake before making her way back to the track, her mane bunched up from the remaining water inside it, the white and black color making it look like some sort of desert treat. With the threat of the hornets hopefully left behind she broke out into a gallop down the road, intent on catching up to the other racers. Predictably, Gilda almost immediately heard some pony call out to her. She glanced back just a little to see it was a young pegasus mare with a black mane. What a dweeb. She didn't even have a reason to complain as a pegasus, seeing as the same option was available to her if she wanted to grab it. "You didn't see anything!" she shouted back, giving a haughty laugh as she did. "It's all in your imaginat-"
Gilda cut herself off mid sentence when suddenly, something most peculiar caught her attention. Some crazy earth pony stallion was shouting at the top of his lungs about hornets as he rushed back towards her. Sure enough, there was quite the swarm on the dude's tail. Gilda barely had time to think. If she had more time, she would have probably come to a better decision. The ponies nearby all seemed to rush back instinctively and jump into the water to avoid being swarmed. Gilda on the other hand decided she was better than the hornets and that they wouldn't dare to attack her. With the ponies nearby submerged, this assumption turned out to be wrong. "Stupid pests!" Gilda shouted as a large portion of the swarm rushed toward her. She began to use her talons to claw the annoying bugs out of the sky one by one. She was losing time quickly and more than a couple of the meddlesome insects managed to sting her. Scowling bitterly, Gilda then roared at the hornets in annoyance. She didn't have time for this. Mobius trotted down the track with a pouch of Sweet Apple Acres apple juice in his mouth, glancing this way and that in search of the pale green unicorn who'd run off before he'd even gotten his drink. He'd noticed that the timid stallion ran off without it while he was drinking his own, but by the time the realization set in, Survey was already out of earshot. If this was his first race, then he'd definitely need the refreshment, so Mobius took it upon himself to try and deliver the juice to him. Of course, the Pegasus took a moment to drink his own juice before beginning his new side-task in the race, so he no doubt had a lot of ground to cover. As he came down the leaf covered path, he noticed a growing crowd of ponies at a narrow bridge, crossing two-by-two. "Perfect!" he announced to no one in particular through his teeth, which were still firmly shut to keep hold of the apple juice. 'Survey'll probably be mixed in with the crowd waitin' t' cross,' he thought to himself as he began to lope towards the crowd. On his way, he noticed a large, non-pony figure fly over the gap and continue some distance past the bridge, prompting a scowl from him. 'I hope the ponies in that balloon they had at the startin' line saw that...' Cheating in a competition like this, a competition that was mostly for fun, was just downright low and petty, in his opinion. Sadly, he couldn't make out anything about the figure other than that it was a griffin at this distance. As he got closer to the crowd of ponies at the mouth of the bridge, he realized he'd underestimated the difficulty of finding a single pony in the colourful group before him. 'Hmn... if I could jus' get t' the other side, I could probably wait 'n find him in one'a the pairings...' He knew he couldn't very well fly over the bridge like that griffin had; that'd be cheating, and worse, hypocritical. As he pondered his options, he heard splashes of water and turned his attention towards the source of the sounds, only to spot a number of ponies forging the river with varying degrees of success. It was apparent that the river had a very uneven bottom, with some parts unusually shallow and others surprisingly deep. With a grin, the pale gold stallion charged down the hill past the crowd before rushing into the water, his head tilting back to let it wash across his chest and neck, keeping the apple juice pouch clear of the comfortingly cool liquid. "Ahhh... now YOU ponies have th' right idea!" he called out to the nearby ponies who were crossing the brook, not really considering whether or not they could hear him. The portion of the brook he entered was shallow at first, letting him keep his footing, but he would probe ahead with each step he took in order to search for any deeper portions of the river. When he encountered one, he extended his wings out to either side, using them to help tread the surface as he swam across the gap to the next shallow patch. It didn't take long to cross the brook, however, and he soon found himself back on shore. Despite being dripping wet from the neck down, the pale gold Pegasus made no effort to shake himself dry. He did, however, have a momentary realization and turned to look back at his left flank. "Aw shoot, I forgot 'bout my number..." he mumbled to himself. Fortunately for him, the number was still there.... technically, at least. The paper was soaked through completely and partially torn, while the number 18 had bled and was barely distinguishable anymore. He turned his attention to his other side, only to find the number on his other flank in worse shape, half of it missing. Apparently, the current of the brook had been washing against his right side. No matter; at least one of them was still eligible, even if it did look more like modern art than a number now. Bleh, the bridge was troublesome. An earth pony had bumped into him during the gallop across and nearly knocked him off the bridge. Not that it would be THAT big an issue, but he wanted to try not using his wings. He came to the edge of the bridge to see a griffon... 'They're allowed to race here?' Zephyr hadn't ever seen one that close. She was distracted by hornets. He thought to himself, if he helps out with the hornets, maybe she would speak with him sometime. He was always curious about how griffons were, what their culture was like. With that thought in mind, Zephyr spread his wings and took to the skies. He wasn't sure how much help he would be, but he'd try to get some of the hornets away. Zephyr had once watched a pegasus use his wings to create wind. He practiced it a bit himself after carefully observing, though he wasn't all that great at it, he could try and see if his untrained method could scare some of them off. The griffon had clawed at the bees and growled at them with her powerful claws. Claws that Zephyr wanted no part of, so he kept his distance to keep from taking a hit in a wild swing. The hornets had swarmed around the griffon... Zephyr opted to try dispersing them as much as he could by zipping around the swarmed griffon, still out of reach from those claws. His trick worked as the created gusts of wind had scattered the bees, but to Zephyr's dismay, he only angered them more and many of them swarming the griffon had now chosen him as his target. Zephyr was concentrating on the mini windstorm, that to his surprise, he was actually creating. He hadn't noticed the bees new target and one had managed to sting him on the flank. The sharp pain quickly broke his concentration, and he crashed on the path's edge, not too far from the griffon. Mojo had remained submerged in the water, hoping the angry swarm of hornet he accidentally stirred up would soon leave. His eyes were closed, trying to think happy thoughts as the Paint stallion held his breath for a moment longer. When he opened his eyes, he was stunned to see a grayish coated stallion with multi-colored mane staring back at him. Before Mojo could figure out what was going on, he felt his body being lifted out of the water. Good thing too, he really needed to start breathing fresh air again. After some fast panting to replenish his internal oxygen supply, he slid off her rescuer's back and onto his four hooves. "Thanks for the rescue, chum!" Mojo neighed as he extended his hoof to shake. "Name's Mojo and I was tryin' to get away from a swarm of hornets..."
The brown and white paused when he turned his head to see how Gilda was now trying to battle the stinging insects herself. "Yeah, THAT swarm of hornets over there! I'd like to stay and chat with ya but I think we both better start running before those buzzing needles with wings choose us as their new target!" With that, the soaking wet Mojo made a mad dash down the trail, attempting to shake himself dry as he ran. Then he looked all around him, hoping his rescuer and his friends Shanna and Lyra were safe and galloping with him. "I know this is a breech of me strategy, but in this case, I think it's rather justified," he thought to himself as he continued running and shaking off river water. In the sky above the race, Hoss's loud warning about the rebounding Saddlesore came just in time! Louise, Jubilee and the Professor barely managed to scatter as the jet pack wearing blue pony zoomed by. "I think Hoss has the right idea!" Jubilee shouted. "We're all Pegasus ponies! We can move enough clouds to block out the sun!" "Then the solar jet would stop running!" added Louise. "Wonderba!" Professor Krashkop neighed. "Brilliant idea! Glad I taught of it!" "YOU THOUGHT OF IT???" Julibee and Louise yelled in unison. "Vell alright, Hoss did, but now vee must act quickly!" the elderly green Pegasus said as he nodded his head. "You're a weather pony, Hoss, tell us what to do first!" "Madam Bistro! Good to see ya agin!" Granny Smith answered her. "I'm doin' well, got three of my grandkids in this here race! Hay ladies, can't ya git that thing to show'm to me?" "I'm afraid we can't," Starflower said sadly. "And I'm not about to use any more of my magic," Misty said, tears falling from her eyes. "I only made things worse for poor Saddlesore!" As she cried, Starflower embraced her, not noticing how Misty's horn began glowing again. "It's alright, sweetie," Granny Smith added as she placed a comforting hoof on the yellow unicorn's back. "I didn't even have a plan! I shouldn't have tried to wing it!" Misty sobbed, inadvertantly sending a surge of magical energy through the lime green mare's body. Granny Smith backed away, her body glowing. "What in tarnation!" the elderly Earth Pony shouted before becoming engulfed in blinding light. When it died down, Starflower and Misty Magic stared at her with eyes bulging and mouths hanging open in shock. "Yur pullin' my leg, ain't ya?" Granny Smith asked in disbelief as she rose upward. She briefly screamed before realizing the reason she was now airborne. A set of beautiful lime green feathered wings which were flapping and attached to her own body. "MISTY? WHAT HAVE YOU DONE???" "But I didn't, I mean, I don't think I did, but not on purpose, I...I...." "YYYYEEEEEEE HHHHAAAAAWWWW!" Granny hollered. "Now I can go see how my grandkids are doin' up close! Thanks gals! I got me a race to watch!" The excited gray maned PEGASUS soon soared into the air towards Sweet Apple Acres. "You turned Granny Smith into a Pegasus! What were you thinking?" Starflower scoulded. "But I didn't even know I was doing it! The spell probably won't be permanent. Most wing spell last at most three days, some even shorter than that. Please don't be angry with me, I feel bad enough already." Gilda was shocked to see some green pegasus stallion fly in unprovoked and go after some of the hornets with some winds. When he was through, only a few hornets were still targeting the griffin, and she dispatched them quickly afterward. She watched as the remaining hornets went chasing after the pegasus. "Well, thanks a lot," she said with a smirk, though the pegasus had already been chased quite the distance away by the hornets. "But they're you're problem now." She added then with sarcasm, "Good luck with that." With that said, Gilda began running again. She had lots of lost ground to make up. Though her body hurt in the places where she had been stung, she still felt alive and ready to keep running. She'd remember the green pegasus though. He had that going for him. So far he was the only one of these ponies to make any sort of impression on her, even if that impression was one of dumb recklessness. Carrot Fields lost some position during his "stop" at the orange filly's impromptu apple stand at the orchard. Of course, he came away from the encounter more confused than anything else. He'd thought that purple unicorn was a mare, which was disconcerting enough, but he'd also embarrassed himself not once but twice in front of the neighbor filly, whose name he didn't even ask. Carrot needed to focus on the race, if not for anything else than to shake those embarrassing moments from his mind. Ach, do other stallions hie sae much bother meetin' fillies? Ach! Dinnae think a that now, think ah th' finish line! The one and only griffin in the race suddenly soared up into the air ahead of him, appearing over the top of the hill he was approaching. Wasn't that cheating!? Haybrained griffin, she wouldn't even follow the rules? Well that just figured. Still, why would she need to do that, being so far ahead? As he crested the hill himself, he saw the dilemma - the broad race trail suddenly came to a narrow wooden bridge over the river, no more than one pony wide! The result was a mass of ponies jockeying for position at the front of the bridge, with two rather large stallions having a stand off right at the entrance. He'd known these sort of scenes all too well, growing up by the lochs. Eyeballing the river, Carrot determined to charge right through it. If it was deep, well, he could swim. What was a bit of water and mud to an earth pony, and a farmer on top of that? He grinned to himself. He did agree with his old stallion on this one - buncha pansies, scared of getting wet. His determined run faltered as he got distracted, slowing down to watch in amazement as the curvy little light green unicorn got up on her hind hooves and started to shuffle along the railing! Ach! How's th' filly doin' that! She usin' some sorta spell? It certainly was a sight! It was too good to last, though, as one of the arguing stallions made a striking move with his hoof and, though he missed the other stallion, managed to accidentally whack the unicorn off the bridge and into the water. Carrot didn't even pause. Here was his chance to shine as a gentle-colt! He barreled into the river with some force, sending up a spray of water all around him, then leaving a sizable wake as he churned his hooves forward to where the filly had fallen. Ach, I dinnae see her! Where is she? He stuck his head under the water, looking around, then pulled his head back up and gave his mane a shake. Oh! There she was! ... Up on shore already! Of course she could swim, dumbtail. What, did you think you were going to just swim to the rescue like some storybook hero? "Nuts and shoe!" He cursed to himself as he came back up the opposite bank, thoroughly soaked and tracking up through the wet mud, giving himself a good shake. He did give the filly a warm smile as he trotted up. "Aye, that was a bonnie magic trick ye pulled up there! Oi'm right chuffed tae have seen it! Tae bad that haverin' idiot knocked ye down!" Bramble was starting to really pant hard... even with that break, and the drink, he wasn't feeling too good. His initial burst of energy and exhiliration had tricked him into pushing himself too hard, and he now knew what was meant by 'pacing'. The faster and more athletic ponies started to pull ahead of him, and try as he might, he just couldn't get back into that groove he'd felt at the beginning of the race. "Oooog... my legs are gonna *hate* me," he groaned... The grey earth pony he'd helped with Applejack passed him up easily, as he tried to keep up. He pushed onwards, doggedly, taking longer strides that ate up the distance more easily, but more slowly. "You can do it," he murmured to himself. "You're a big tough stallion, right?" The apple cider just left his mouth feeling sticky, now... what he wouldn't give for just a bit of water. He crested the hill and looked down upon the river and the narrow bridge. "You just ... had to ... ask for ... water ... didn't you?" he panted to himself, making his way down the hill towards the big crowd clustered at the start of the bridge. He paused at the back of the crowd, pondering pushing his way to the front. "Hey!" he called to the stallions holding everyone up. "Just get going, you're making yourselves lose with your fighting!" They didn't hear him over the noise, of course, and he sighed, glancing down at the river... lots of ponies were crossing down that way, but he wasn't the best swimmer even at the best of times. But at least he could get a drink, while waiting for this crowd to clear up at the bridge. Oh, he was going to be *so far behind*! He ducked his head and took a long, deep draw from the cold water, then let out a refreshing sigh. He looked out over the water, at the ponies swimming their way across... if only there was another bridge! A big white blossom burst up out of the water, bigger than his head, and then the lilypad unfurled from it to slap the surface of the water, bigger than any lilypad had a right to be, bigger than he was, even! Perhaps those big clydesdale ponies wouldn't be able to support their weight on it ... but this little unicorn certainly could! Another lilypad burst from the water, a little beyond that, then another, and another! He let out a long breath as he let the magic fade away. That was tiring in its own way, too, but now he had his path! He jumped out onto the first lilypad, and let out a nervous noise as it sloshed under him. Eep! This wasn't as easy as he thought it'd be! He jumped from lilypad to lilypad, pausing each time to catch his balance again... eep... eep! EEP! He took the last three as quickly as he could, buty tripped on the last one, burying his face into the mud of the bank. He pulled himself out, giving his head a shake, a hoof coming up to wipe the mud out of his eyes. His ears were ringing, and he could have sworn he just heard somepony say, "Right you are, Ken!" He looked around dazedly. Well, he was all right... back to the race! He started up the hill on the far side, grinning. Take that, oversized ponies! He... wait... why were ponies running back towards him? Was he going the wrong way? He couldn't have! No, he had to be going the right way! There was one of the signs! He trotted on up the path, taking a deep breath. He could do it! He was sure of it! Oh, if only he had a way to motivate himself to go faster! He got to the top of the hill and ran right into something fluffy and and feathery and screechy and buzzy... he dropped back and let out a *yelp* as something stung him on the rump! He ducked a stray swipe of a claw, and tore off down the trail! "STOP WISHING FOR STUFF!" he yelled at himself as he desperately kept a half-step ahead of at least some of that swarm of wasps! Big Mac had more or less followed the herd of ponies and critters with a fair pace, although he was somewhat still a fair way from being in the lead - he didn't let that bother him, however, as winning was hardly the reason he was here at all...he was here because he wanted to test himself up against the other competitors, regardless of what they were. This hadn't been too bad so far, but although the stallion had made a fair bt of progress under his own steam up until this point, he knew that he really needed to slow the pace down a little and take it easy...'lest he wind himself too early and lose any chance to recover. His pace eases up and he drops back a little bit, keeping up a light brisk trot as he makes his way towards the bridge - drinking in the pleasent surroundings with a fairly peaceful expression as he maintains his newfound lesser pace. However, he soon found his peaceful moment disrupted when all of a sudden he could hear the loud scream of somepony - something about hornets?
" Pfft, hornets aren't any trouble if ya keep ya head an' keep ya distance from 'em! " Really, there was absolutely nothing to it - seemed like a lot of the ponies here were getting way too dramatic for their own good! Deciding he had enough time for a smooth cool drink of water, he made his way towards the river and bent down to take a sip...it was fresh, delicious and for the most part entirely healthy for any pony. He could feel his energy start to resurface slowly...meaning that he'd be quite content to head back into a good running pace for the next leg, but for now he was going to resume a more even speed until he reached the 4th leg of the race, and then it was going to be all out until section 6 for one last recovery before going all out once and for all towards part 7, where he planned on beating his sister to the finish line. Yup, right now it seemed like he had formulated a perfect strategy...nothing was gonna keep Big Macintosh from achieving his goals this day. That much was for darn sure! "'Ornets? I dunsee..." Breaker trailed off, shaking hooves with the pony. Then she caught his eye. The griffin that had given him the brush off earlier. He stared for a moment at her behavior, a laugh slowly building as a slight shake in his shoulders, rippling up his neck and bursting out of his mouth. Before he finished, his rescue case had vanished, galloping off with the herd, leaving Breaker dripping wet at the water's edge, his laughter dying as he watched the griffin's behavior. "Quite de rude ting, ent she?" He wondered quietly. Breaker shook himself from head to tail, flapping his dreads around and sending water flying in every direction, including on passing ponies. Oblivious to the groans and dirty looks he earned in the process, Breaker galloped up the bank and rejoined the race, again at the rear of the main pack. No matter, though, he made his way down the path on the heels of the largest crowd of runners. He was starting to notice the leaves now, not just the beautiful colors, something he'd found absolutely breathtaking from the moment he'd set hoof in the wood, but seeing them cascade down through the air on the heels of the organized stampede was even more beautiful. Grinning like a schoolfilly, Breaker kicked out his rear hooves and took off into the forest, regaining a bit of ground as he did. With pieces of paper in his mouth, and the silvery duct tape looking somewhat like a pair of dark blue eyebrows adorning the papers, Klondike tried his best to hold back a tear as the stinging sensation from having just peeled a few strips of hair off of his own coat slowly subsided. Now more than anything, he just wanted to sink into the cool river water and take a minute or two to refresh himself, and let his two fresh bold spots soak for a bit. "Oh my! That had to hurt!" His right ear twitched as a familiar voice reached it and he turned around to see Shanna making her way through the river. “More dan you dhink Miss Skymight.” Waddling into the river, he called out after her in slightly muffled tone as he did his best not to drop the papers into the water. He was determined not to let a single drop touch them. Not after what he just endured. Once he made it to the middle of the river, he found that the water in the particular area he was in barely reached half way up his chest. Deciding this was as good as refreshing place as any, he contently closed his eyes and sat on his haunches as he let the river water wash away all the sweat from the race. The slight ripples through his coat, and the refreshing coolness on his bold spots, felt like heaven to him. Suddenly, as a shadow flew over him, he opened his eyes just in time to see a griffon flying over head and making her way to the other bank. “HEY! I haw dhad grijjin ad dhe sdarding lime! She’s suhhosed to be running, nod flying!” He called out in surprise through a paper filled muzzle. "HORNETS!! BACK INTO THE WATER!!" “Horneds?...” Klondike immediately caught sight of Shanna and a painted coated pony barreling into the river. “Whad dhe hay’s godden indo dhose GHAH!” He suddenly saw the black cloud of insects heading for the river, half of the swarm breaking off after the griffon. With one seeming-less swift motion, Klondike kicked his own hooves from under him and he rolled into the water. Floating just under the surface on his back, the only thing visible as the cloud of hornets flew over head was a dark blue muzzle holding the two pieces of paper with the number 34 and their comically duct taped dark blue hair eyebrows. A single hornet though, found them too amusing and landed on one of the papers. “HA! Silly little hornets. I’m well hidden under the water. Come on, just ignore the pieces of paper and fly away and I’m sure… I’m sure… I’m floating away?” Surely enough, the slight current was slowly drifting him at a snail’s pace down the river, but luckily, towards the opposite bank. After a minute or two, he finally came to stop a few feet away from where the rest of the ponies were coming out of the river. Still laying on his back with his hooves, muzzle, and half his face sticking out of the water, he watched as the little hornet finally lost interest and flew off to rejoin the rest of it brethren. *SIGH* “Well, at least the numbers a dry and no pony can say I’m not one to just “flow” with things.” Klondike thought to himself as he just lay there as he was, trying to enjoy a last few minutes of relaxation before continuing the race. Shanna whewed and got out of the water after noticing everypony else getting back out. She giggled as Mojo was lifted out of the water by a larger grey pony with multicolor dredlocks. Finding it was safe, she was about to head off herself when she saw the purple unicorn colt she had jumped over in the orchard arrive at the brook. She was about to come over and help him across as an apology when his horn glowed and giant lilly pads appeared in the water. "WOW!" Seeing things were well in hoof for him, she sprinted up the bank and put her numbers back on from her underwing pouch. Smirking, Shanna passed the griffon as she fought off the last of the hornets. Unable to resist, Shanna giggled "Seeya speedy! ", wiggled her tail at the griffon, then sprinted to catch up with Mojo and that blue unicorn mare. She hoped she would see Savory in the race. she heard the restauraunt owner would be racing too. As she got caught up, she saw that strange pony with the dredlocks again "I wonder where he's from?..." she thought out loud to herself.